It is fairly unique for a company to focus on just a few operating systems. In a field where there are so many services and software solutions, we specialize in Linux and Unix security. 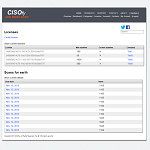 Our tools help you to perform regular health scans of Linux, macOS, and Unix-based systems. 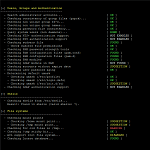 Lynis is a free and open source security and auditing tool. It runs on Linux, macOS, and other Unix-based systems. The primary focus of Lynis is to perform a health check of systems. It helps also to detect vulnerabilities and configuration management weaknesses. Lynis performs an in-depth local scan on the system and is therefore much more thorough than network based vulnerability scanners. Read more about the tool or use the Get Started guide. Lynis Enterprise is a software solution to perform security auditing, compliance testing, and apply system hardening. It includes Lynis in the core and focuses on environments with Linux, macOS, or other Unix-based systems. Where Lynis stops, Lynis Enterprise continues. The solution helps you to gather all available data from your systems and measure your security efforts. Lynis Enterprise provides the answer to what and how to improve your security defenses. It does so by using in-depth auditing and provide guidance during implementation. The management interface allows you to quickly determine where to focus your time. With additional support and tools, like an API, integration within your IT environment is easy. Additional features: plugins, central management, web based interface, API, dashboard, compliance checking, extensive reporting options, and hardening snippets. Like to learn more about the differences between the standalone Lynis tool or its Enterprise version? Looking for an in-depth understanding of Linux security? Our training program named Linux Security Expert provides practical labs.